I am completely aware that the recipe I have here on this page and sharing with you, is traditionally very far from the Nordic kitchen. 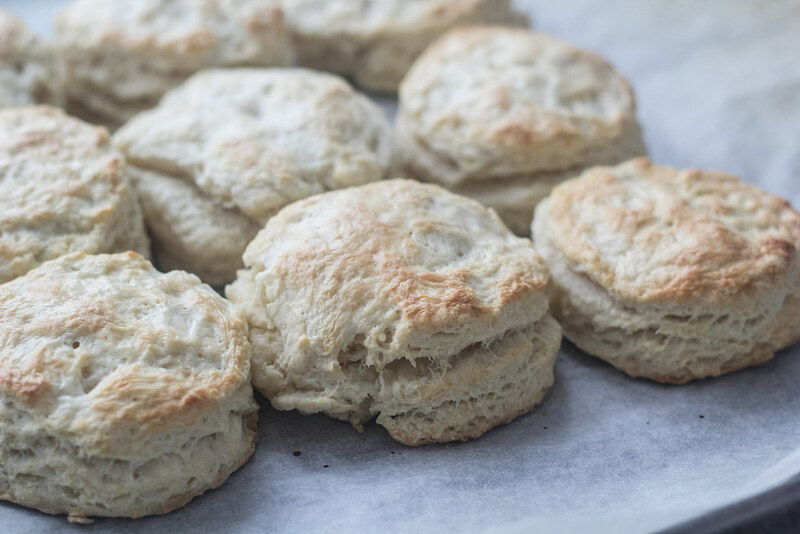 However, even though these American Buttermilk Biscuits is, as the named simply applies, originally from the states, that does not make them less delicious. I have said it a couple of times here on my blog and on my social media channels; I really enjoy American food and in general love traveling in the states. The first time I tried an American Buttermilk Biscuit was on road trip I did on the west coast. I still remember it clearly, it was one morning at a McDonald restaurant where I was looking to get a super quick breakfast and of course use the free Internet top browse travelling trips for the day. At that time, the McDonald’s in Denmark and the other Nordic countries did not serve breakfast, so I had never tried a Egg McMuffin before. The breakfast was not something special, but I instantly knew that I had to try making those Buttermilk Biscuits myself. 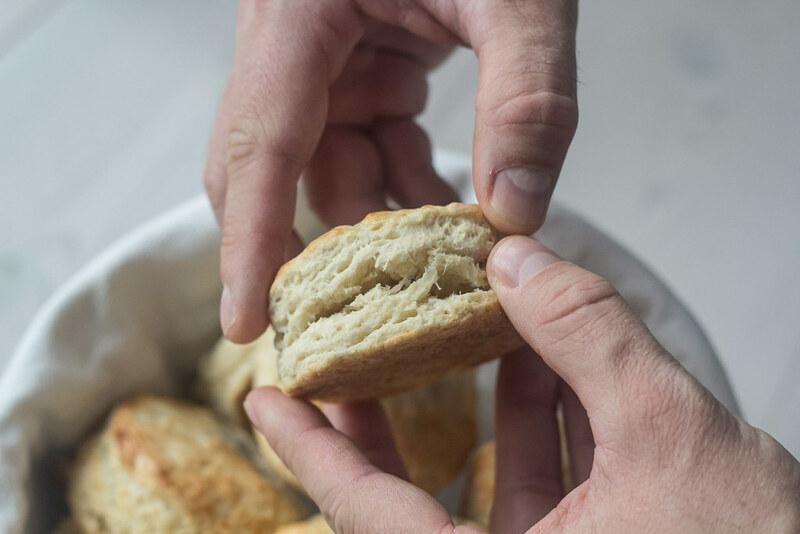 These biscuits are make from a few and simple ingredients, where the main ingredients are all-purpose flour, flakes of cold butter and of course buttermilk. What I really like about these biscuits are the fluffiness and the great and very delicious taste, which is probably from the buttermilk and the flakes of butter. You can serve these biscuits toasted with some cold butter. 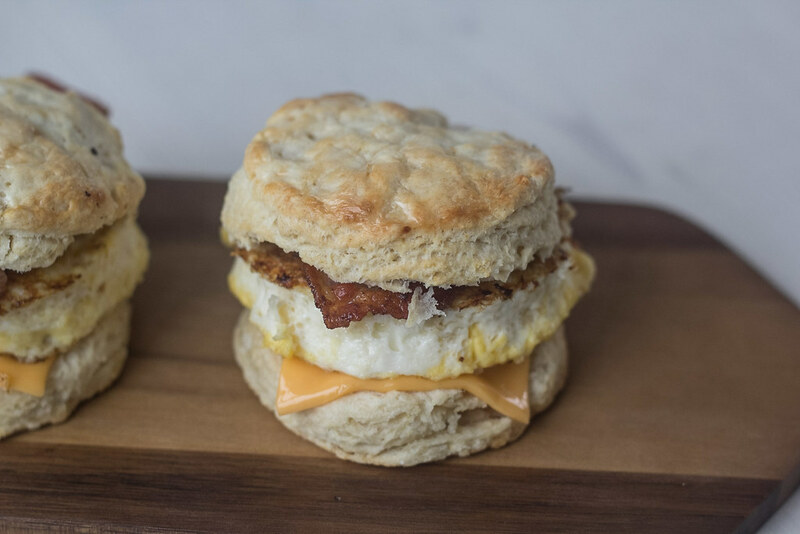 However, I personally always use them as the buns with a fried egg, two crisp strips of bacon and a sheet of cheddar cheese in between – my personally and homemade Egg McMuffin. Of course, these biscuits, together with the bacon, cheese and eggs are not the most healthy breakfast combination. However, that do not change the fact that they are super delicious and one of my personal favorite weekend breakfast dishes. These buttermilk Biscuits are actually not that difficult to make yourself. There is just a couple of steps that you have to pay a bit attention too. 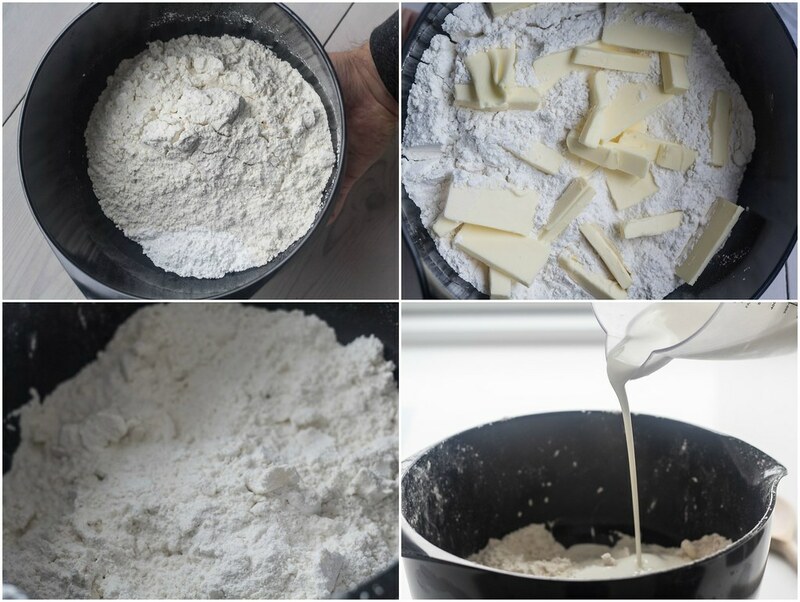 In a large bowl, you start by gently assembling/kneading the flour, salt and thinly sliced and cold butter together. 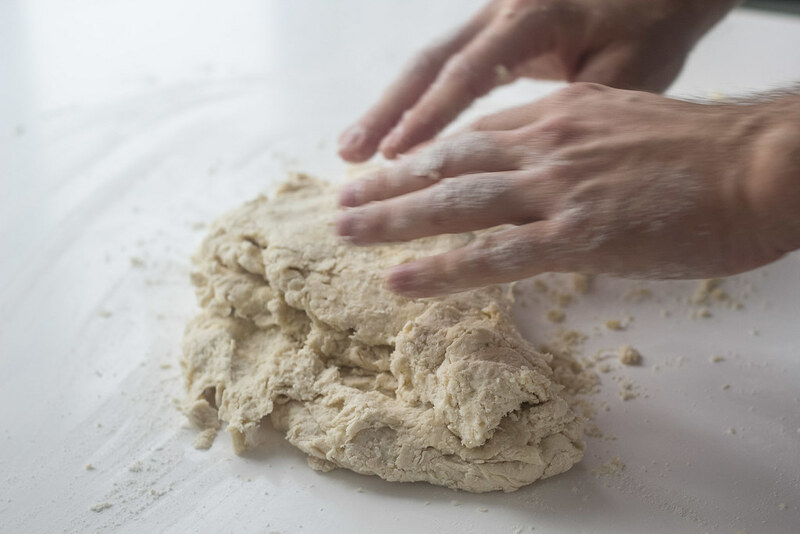 In this step, it is important that you do not knead too much and aggressive, this is to avoid that you apply to much heat into the dough and melting the butter. There should still be flakes of butter in the dough when it is assembled. 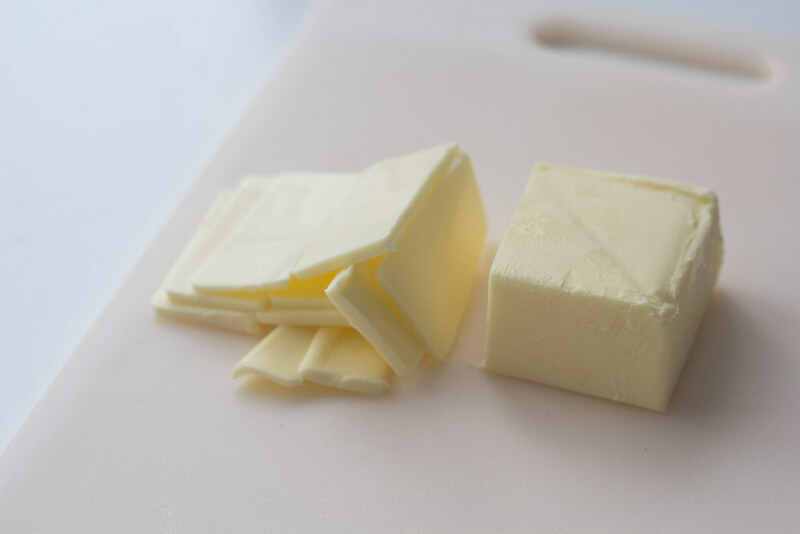 These flakes of butter will give the nice layers in the baked biscuits, which we are looking for. 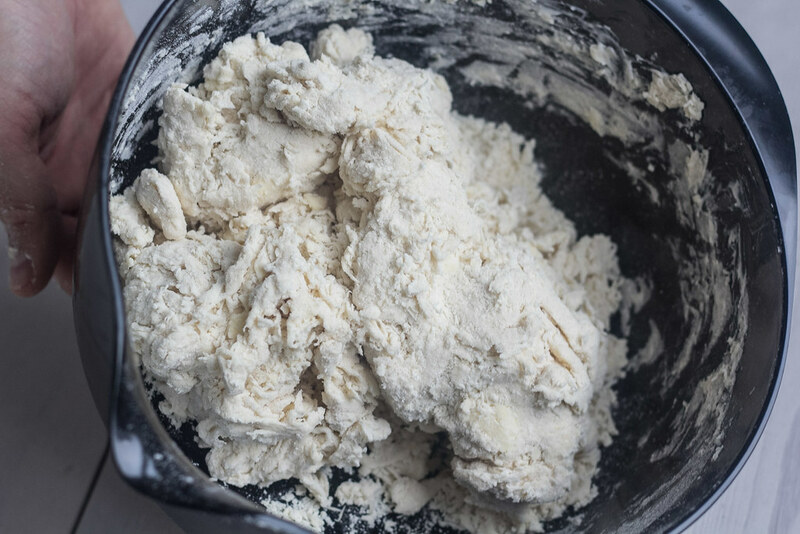 When the butter and the flour is assembled, you gently mix in the buttermilk and knead it all together. On the kitchen table; you flatten out the dough using your fingers, fold it one time and flatten it again. You should repeat this step a couple of times. Again, try avoiding applying to much heat into the dough. 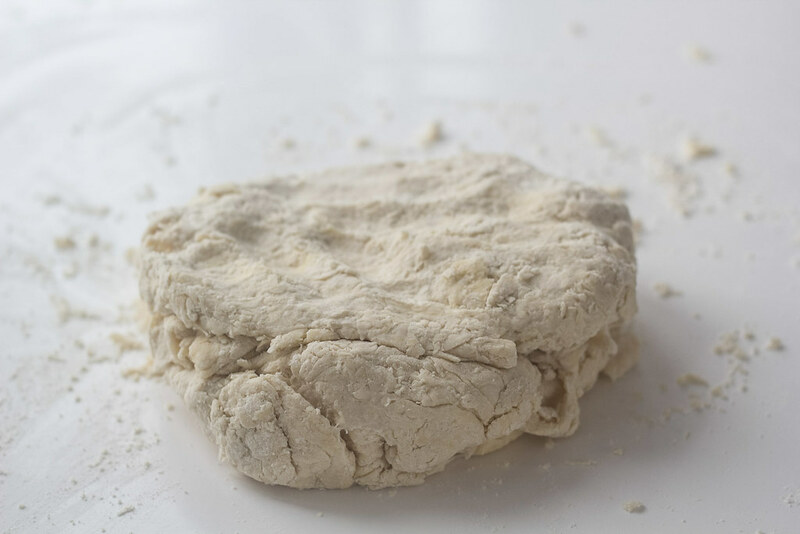 The sheet of dough should have a final thickness of about 2.5 cm (1 inch) before you cut out nice circular biscuit using a biscuit cutter. You can also use a cup, glass or similar for the cutting step. 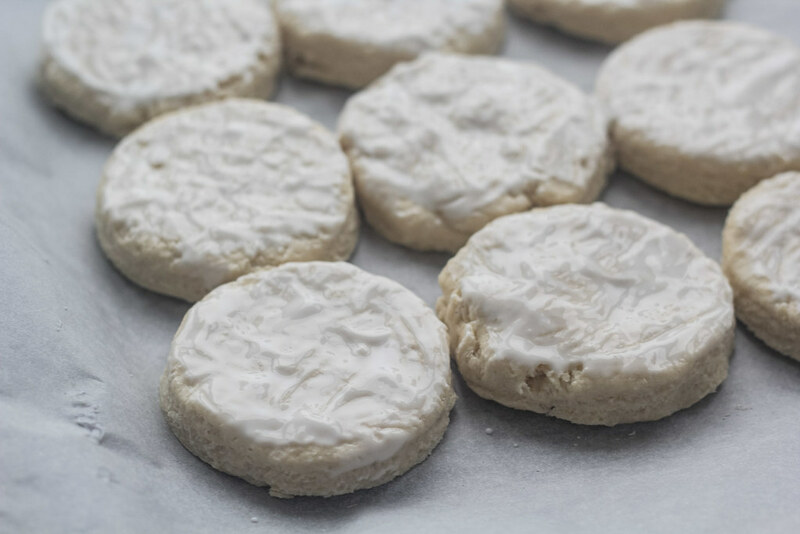 Place the circular biscuits on a parchment paper covered oven plate and bake them at 220 C (430 F) for about 10-12 minutes. 1. 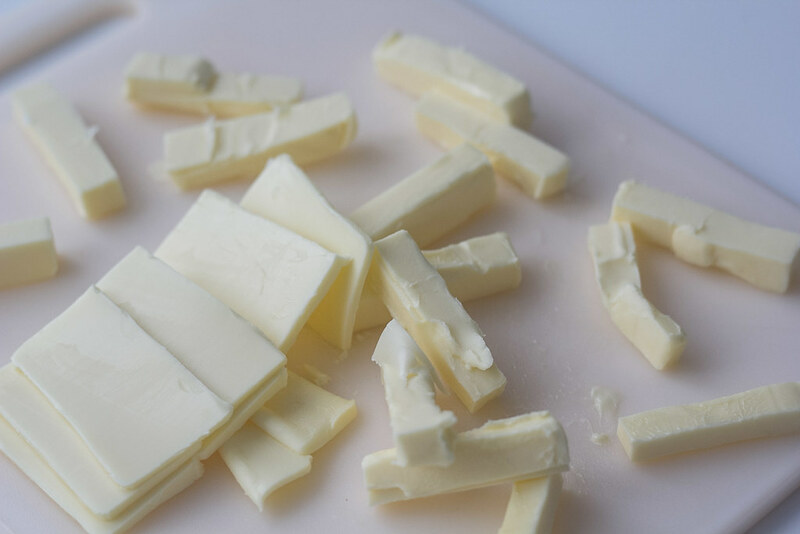 Cut the cold butter in large flakes or sticks. Place the flakes on a plate and leave them in the fridge to cool down again. 2. 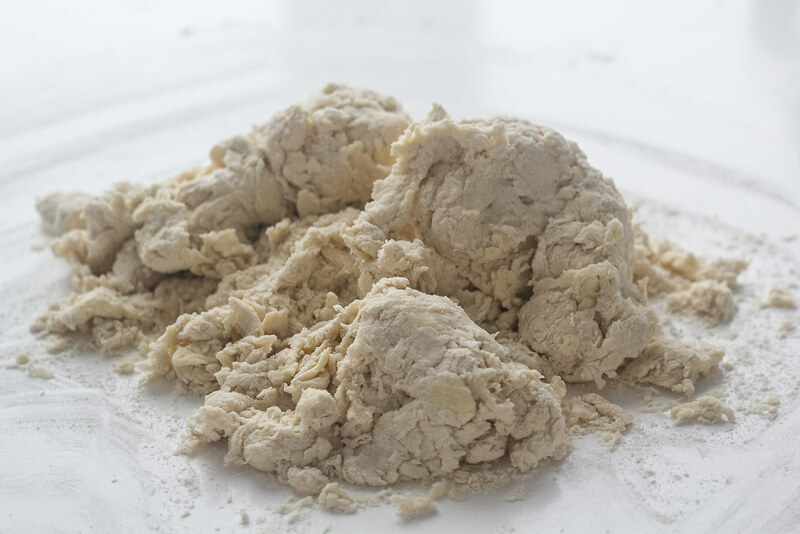 While the butter is cooling down in the fridge; in a large bowl; mix the all-purpose flour with salt and baking powder. 3. Now mix then cold butter flakes with the flour-mixture; Use your fingertips to crumble the cold butter with the all-purpose flour. Continue until all the butter is turned into pea-sized bits. 4. Pour the buttermilk into the butter-flour mixture. Use a large wooden spoon or similar to assemble the ingredients into a dry but a little sticky dough. 5. 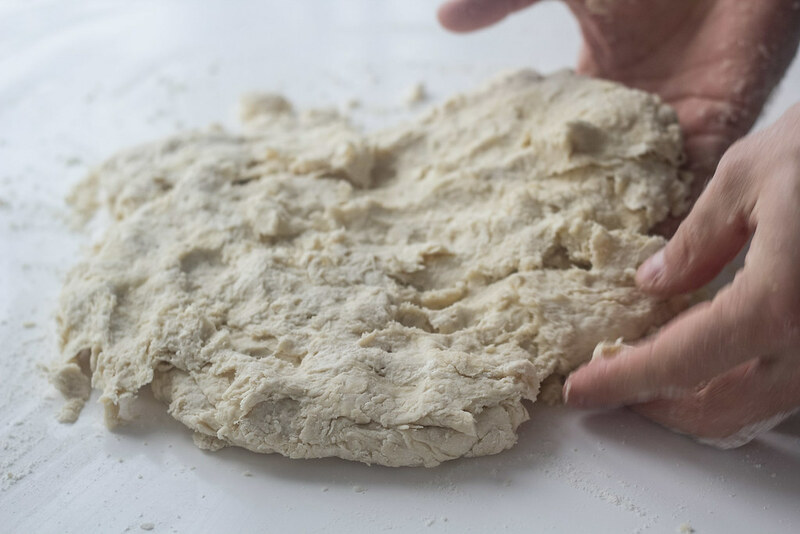 Pour the dough onto your kitchen table; gently combine the dough into a large rectangle plate with a thickness of about 5 cm (2 inch). 6. 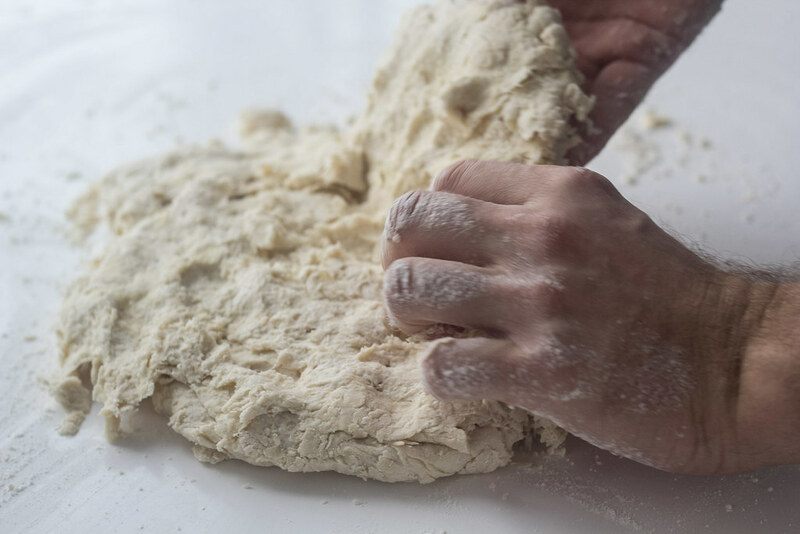 In this step we create the nice layers in these biscuits; Start by folding the right side of the dough over the left side – like closing a book. Now pat the dough into a new rectangle with a thickness of about 5 cm (5 inch). Fold the dough again, this time from the bottom over the top. Continue this folding, patting and folding step several times. Each time the dough should start to hold a little more together. 7. Using a rolling pin to flatten out the dough. The thickness should be about 2-2.5 cm (3/4 – 1 inch). 8. Use a biscuit cutter or similar to gently cut out nice and circular biscuits. Try not to turn the cutting tool to much but only push it straight down into the dough. The diameter should be about 7-8 cm (3 inch). 9. 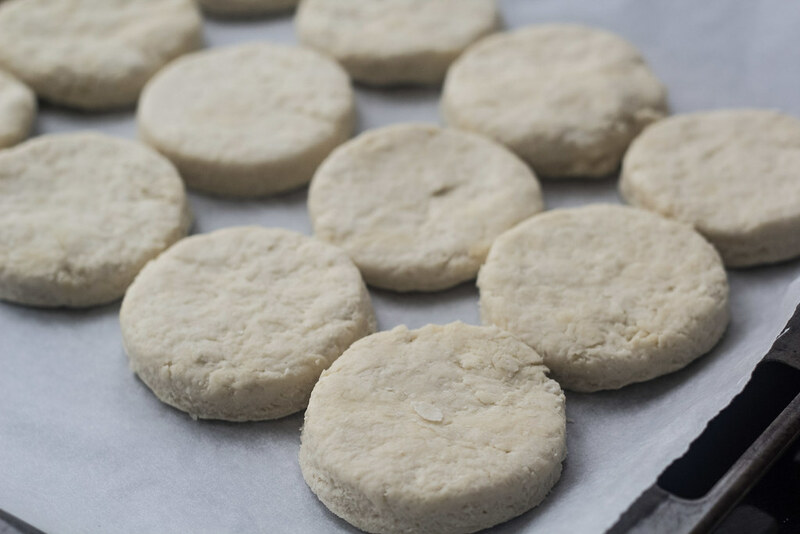 Place the biscuits side-by-side on a parchment paper lined oven plate. 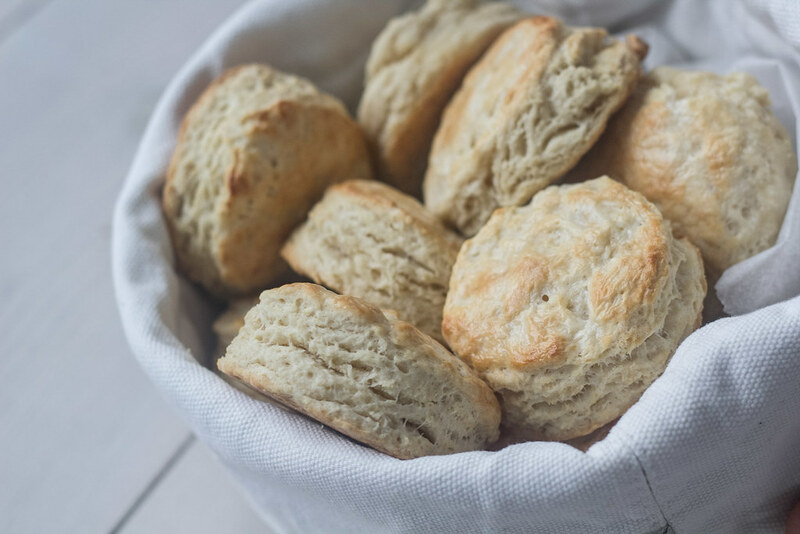 Brush the top of the biscuits with a little buttermilk to give them a nice and golden color when baking them. 10. Bage the biscuits at 220 C (430 F) for about 10-12 minutes or until they are nice and golden. 11. 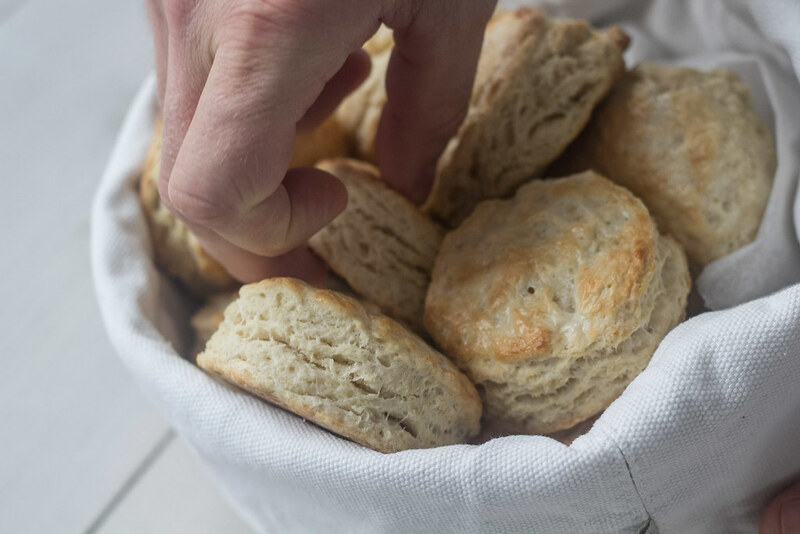 Let the baked buttermilk biscuits cool off for a couple of minutes before eating them. Tip: When you want to divide the biscuits into two pieces; break the biscuits and they should crack in the layers. 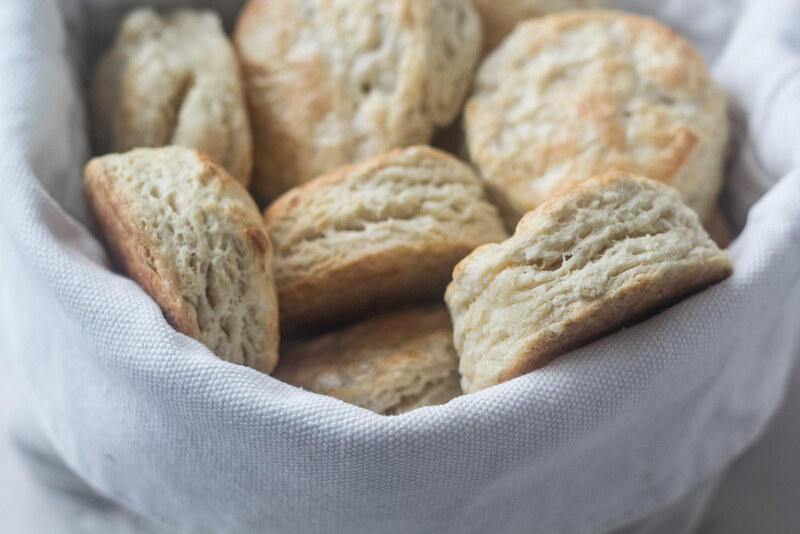 You can freeze the unbaked biscuits for up to 3-4 months. Bring them to room temperature before baking them. The best Southern biscuit place, Bojangles, also makes Bo Berry Biscuits https://pin.it/ehc6i3ff5enerr. So, so delicious. Soak the blueberries if you use dried. 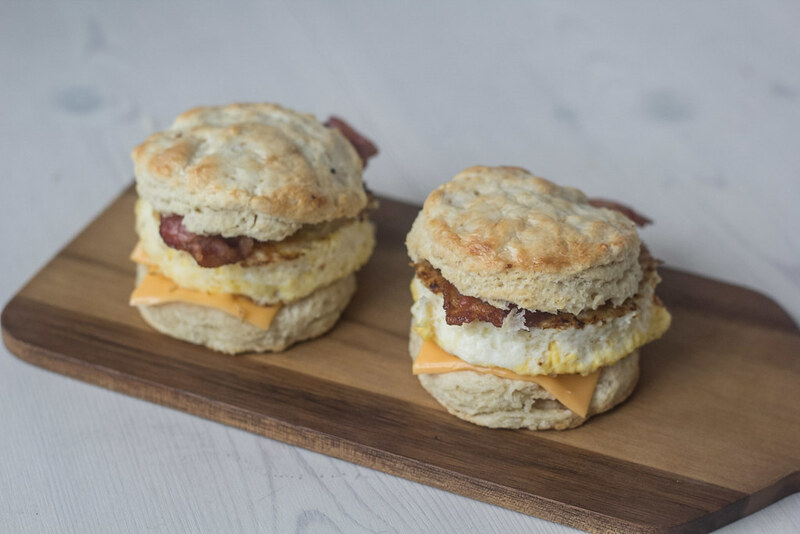 I love my biscuits with country ham. Slices of a salty hickory smoked ham similar to prosciutto, but thicker. Around 1/8 inch. You rinse the ham and then pan fry until heated through. The juice from the ham seasons the biscuit. You can even make your own breakfast sausage. https://pin.it/6e4gd6pwj6xzh7 Lots of Southerners like me prefer a lighter sausage from half pork and ground turkey or even all turkey. I also love scrambled eggs with crumbled sausage.